Michael Moore: "I Want Mosque Built on Ground Zero"
"I am opposed to the building of the "mosque" two blocks from Ground Zero. Why? Because I believe in an America that protects those who are the victims of hate and prejudice. I believe in an America that says you have the right to worship whatever God you have, wherever you want to worship. And I believe in an America that says to the world that we are a loving and generous people and if a bunch of murderers steal your religion from you and use it as their excuse to kill 3,000 souls, then I want to help you get your religion back. And I want to put it at the spot where it was stolen from you." And I think you all know where to find that. Someone should remind Michael. He states, "There is a McDonald's two blocks from Ground Zero. Trust me, McDonald's has killed far more people than the terrorists..." Moore finishes off his blog post, "Let's each of us make a statement by donating to the building of this community center! It's a nonprofit, tax-exempt organization". The Jewish Community Center of Manhattan may have its lgbtq program which enjoys "special events celebrating Gay Pride", but their Islamic buddies don't have the same liberty. As a friend once pointed out - Western men get stoned and then have man love. Muslim men have man love and then get stoned. Not for long though, because Greg Gutfield is in discussion with a number of investors to start up a new Islam-themed gay bar right next to the mosque Park51, in an available commercial space. I wonder what Michael Moore has to say about that. I will be so happy when this man leaves this planet. He is one miserable, pathetic, excuse for a human being. I have to say and GOD forgive me but he wasted alot of skin on that man.But I'll keep him in my prayers he needs them. Since Michael Moore is as close to being a PIG as a human being can get.. he should definately fear the Islamists..
it is unbelievable that hate for America draws them in to be fooled into trusting the deceitful stealth jihadists who will soon slit their throats. When the muslims come here and flush our toilet for us, since we refuse to do it ourselves, I would guess that in 2 hours there will be no more queers in North America, and by the end of the day, there will be no more democrats either. And no more Michael Moore. Maybe that isn't such a bad thing. And I want Michael Moore buried -- anywhere is sufficient but an old hog pen would be quite appropriate. I could care less whether he's dead or alive, I just want him buried. Those Jews are not orthodox jews, they are liberal reformed idiots. They would not feel welcome in an orthodox shul. They are an embarassment. That so-called Rabbi is not a real Rabbi in my eyes, and gives all true religious jews a bad name. 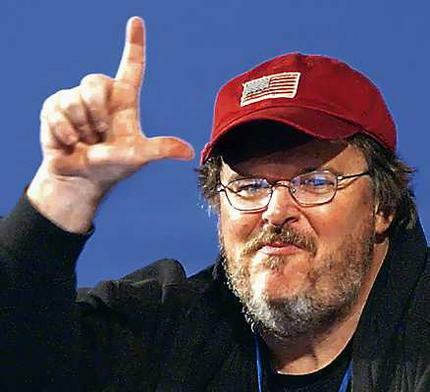 Every time Michael Moore opens his mouth, one can guarantee being "treated" to the worst pontificating the world has heard from a fat man since Hermann Goering took the stand at Nuremberg. Not to put too fine a construction on it, this unwiped commie *sshole doesn't deserve to live in a free country!! If ignorance is truly bliss, then Moore is among the most blissful on the planet. Also, I like all the posted comments so much I can't decide which one I like best. It's nice to land on a page and find it loaded with like minded people.